Cory Booker's column in The Stanford Daily on April 8, 1992. 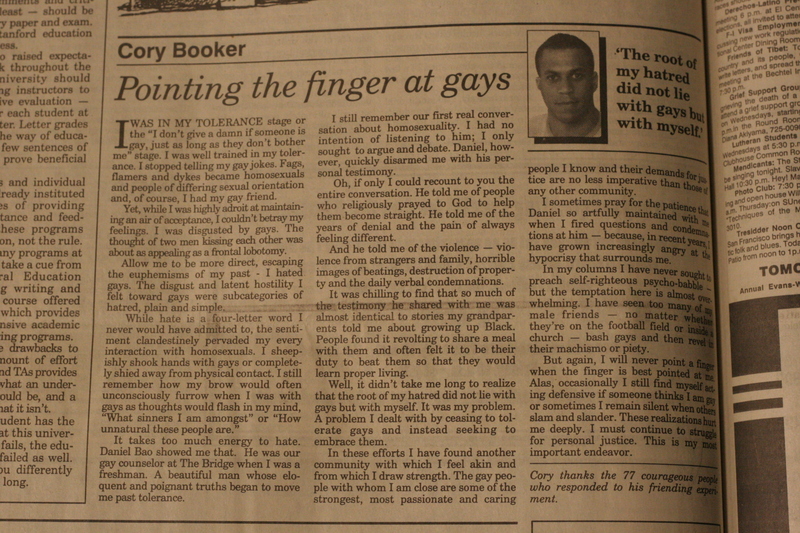 Cory Booker’s column in the April 8, 1992 Stanford Daily. Editor’s Note: Every Wednesday, The Stanford Daily will publish an interesting opinions piece from The Daily’s archives. Cory Booker ’91 M.A. ’92 is currently the Mayor of Newark, N.J. While at Stanford, he was a columnist for The Stanford Daily. This article was published in Volume 201, Number 33 of The Stanford Daily on Wednesday, April 8, 1992. I was in my tolerance stage or the “I don’t give a damn if someone is gay, just as long as they don’t bother me” stage. I was well trained in my tolerance. I stopped telling my gay jokes. Fags, flamers and dykes became homosexuals and people of differing sexual orientation and, of course, I had my gay friend. Yet, while I was highly adroit at maintaining an air of acceptance, I couldn’t betray my feelings. I was disgusted by gays. The thought of two men kissing each other was about as appealing as a frontal lobotomy. Allow me to be more direct, escaping the euphemisms of my past – I hated gays. The disgust and latent hostility I felt toward gays were subcategories of hatred, plain and simple. It takes too much energy to hate. Daniel Bao showed me that. He was our gay counselor at The Bridge when I was a freshman. A beautiful man whose eloquent and poignant truths began to move me past tolerance. I still remember our first real conversation about homosexuality. I had no intention of listening to him; I only sought to argue and debate. Daniel, however, quickly disarmed me with his personal testimony. Oh, if only I could recount to you the entire conversation. He told me of people who religiously prayed to God to help them become straight. He told me of the years of denial and the pain of always feeling different. And he told me of the violence – violence from strangers and family, horrible images of beatings, destruction of property and the daily verbal condemnations. It was chilling to find that so much of the testimony he shared with me was almost identical to stories my grandparents told me about growing up Black. People found it revolting to share a meal with them and often felt it to be their duty to beat them so that they would learn proper living. I sometimes pray for the patience that Daniel so artfully maintained with me when I fired questions and condemnations at him – because, in recent years, I have grown increasingly angry at the hypocrisy that surrounds me. In my columns I have never sought to preach self-righteous psycho-babble – but the temptation here is almost overwhelming. I have seen too many of my male friends – no matter whether they’re on the football field or inside a church – bash gays and then revel in their machismo or piety.